In the past 25 years or so, research has established that the view that can be enjoyed from a window as well as the amount of daylight coming in through it are crucial to the quality of life inside a building. In this project, however, we wished to investigate if the openings themselves as part of the architectural design could contribute to comfort and well-being. Our results show, that openings in themself can influence physiological stress reactions and, as stress has long been known to influence the immune system, even a person’s health and physical well-being. We focused on the measurement of physiological stress, especially the hormone cortisol, which are a stress hormone as well as a hormone used by the organism to control the immune system. The most basic reaction to stress is, perhaps, the so-called fight-or-flight instinct. Using this as a point of departure, we hypothesized that a space with openings that offered the potential for flight would result in a less pronounced reaction to a stressful situation than a space with no openings. To test this hypothesis, we used a virtual version of the so-called Trier Social Stress Test. The ‘classical’ Trier Social Stress Test (TSST) was developed in Germany in the early 1990’s as a standard stressor in laboratory experiments on psychosocial stress. In the experiment, participants have to perform two tasks in front of a ‘committee’ of two or three people who have an authoritative appearance (usually trained actors.) The participant is informed by the chairman of the committee that he must undertake the following: a 5-minute prepared speech in which he has to present himself as a job applicant, and another task about which he is given no information. After five minutes of preparation, the participant delivers his speech and is then asked to count backwards from 1687 in increments of 13 for five minutes. Each time he makes an error he is asked by the chairman to start over again. After completing both tasks the participant rests for 40 minutes while his stress level slowly decreases. Researchers at Lund University have developed a virtual version of the TSST in which both the room and the committee are generated by a computer within a so called CaveTM. The CaveTM is a system of five projectors projecting simultaneously and coordinated by a computer onto three screens and the floor. The system creates the illusion of being in a three dimensional space, when the participant is wearing a special set of glasses and a head tracking device. The use of this system allows for a systematic variation and design of the architectural space. 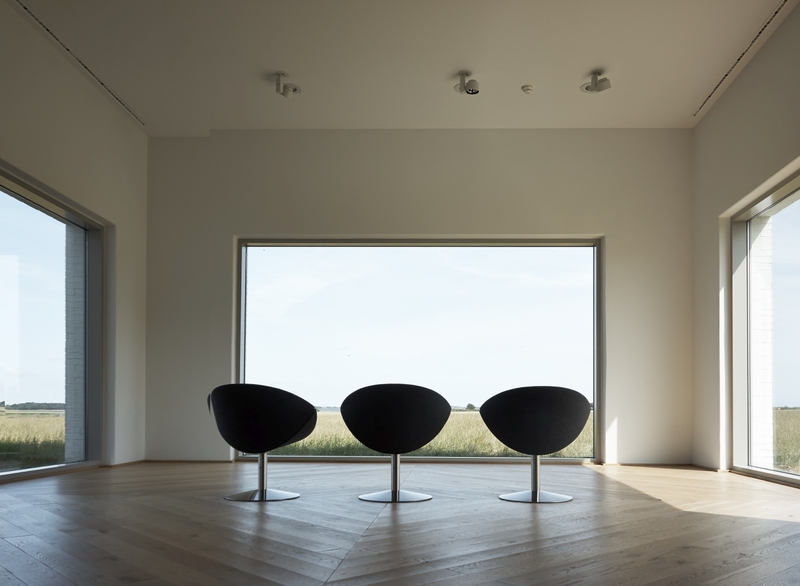 We designed two spaces: a space without any openings and a space with three openings towards a seemingly endless and empty landscape that continued to the horizon. The body has two stress systems – the sympathetic nervous system, which is part of the autonomous nervous system and the so-called HPA-axis, which is responsible for releasing cortisol. During our experiment, we measured the reaction of the sympathetic nervous system, which can be done by using heart rate variability, and the release of cortisol. The latter can be measured in saliva approximately 10 minutes after it has been released into the blood stream. At this stage of the research, our findings demonstrate that openings have a beneficial effect on stress levels, but future research will be needed to establish, e.g. the most favorable position, size, etc. of the openings. Furthermore, other spatial features might also influence a person’s stress response. All in all, as more knowledge is gathered we will probably be able to see more and more clearly the importance of openings to the well being of people within otherwise closed spaces. An importance that is on equal footing with all kinds of technical devices that takes up more and more space within our buildings to ensure our physical well-being like heating, ventilation, and artificial lighting systems. After all, the control systems within the brain affected by these factors are largely the same. As the immune system is potentially influenced by stress, this knowledge will undoubtedly influence the design of hospitals and other health care facilities. Furthermore, stress is in itself a major and growing problem today, threatening individuals’ quality of life and burdening economies worldwide. Stress is estimated to be responsible for about 50 – 60% of lost workdays within the EU, which costs employers an estimated 20 billion Euros annually. Untreated stress is the suspected trigger for more than half of all cases of depression in Denmark and leads to about 3000 cases of early retirement each year. Thus, if we as architects can learn to design buildings that, at the very least, do not contribute to stress, we will be making a significant contribution to individuals and society as a whole. To carry out our study we formed a cross disciplinary research group consisting of scholars at Aalborg University, University of Cophenhagen, Lund University, and the National Research Center for the Working Environment in Copenhagen, which possesses one of the best laboratories in Europe for analyses of the kind of samples we wanted to use.